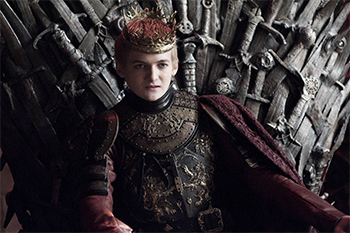 Jack Gleeson began acting at the age of seven in the Independent Theatre Workshop. His first roles were in films such as Reign of Fire in 2002, Batman Begins in 2005, Shrooms in 2007, and A Shine of Rainbows in 2009. In 2010, he appeared in a leading role in All Good Children. The reviewer for Variety magazine considered Gleeson "the pic's big discovery". Gleeson starred as Joffrey Baratheon in the HBO series Game of Thrones. He cites Joaquin Phoenix's portrayal of Commodus in Gladiator as an influence on his performance. He is the founder and artistic director of Collapsing Horse Theatre Company, which is based in Dublin. In 2014, Gleeson confirmed he would be permanently retiring from acting after concluding his work in Game of Thrones and has since pursued academia. Gleeson will be appearing at Dragon Con on Sunday only.